My architect friend, Paul, smiles when I refer to a particular building as "a pile." Smile if you will, the Gilsey House at 29th Street and Broadway is a Victorian pile. And a wonderful one at that. Pyrotechnics in cast iron, this is the type of building that makes me love architecture. Peter Gilsey was a Danish immigrant who made his fortune in America as a merchant. Not content with his success, Gilsey bought up properties in midtown, where the north-bound theatre district was emerging. He recognized that this area would need a high-class hotel very soon. In 1868 he purchased the last farm in midtown from Caspar Samlar and with that, his location was set; including the grounds of the Saint George Cricket Club. 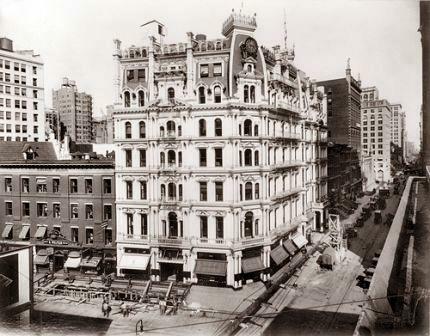 Gilsey commissioned architect Steven D. Hatch, who later designed the landmarked 1888 Laclede Building in St. Louis, to create his 300-room hotel. Gilsey envisioned a hotel that would rival the downtown hotels that catered to the carriage trade. And he understood that if you wanted to entice the wealthy, you had to spend money. So Gilsey spent in those post-Civil War years $350,000 on his new hotel. The Gilsey House opened in 1872. The rooms were outfitted in costly woods like rosewood and walnut. The carved fireplace mantles were of the finest marble. Gilt bronze chandeliers hung from elaborate plastered ceilings. The exterior was a visual feast -- arches, columns, angles; Hatch's fantasy rose from the sidewalk to the roof in an explosion of cast iron ornamentation. 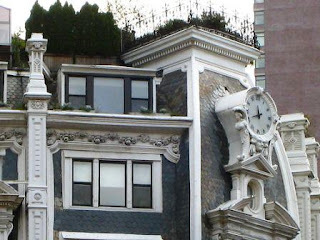 Under the exuberant cast iron cresting of the mansard roof cap an enormous clock rests on cast iron mermaids that are far too high from the street to be seen. Extraordinary garlands of full-blown roses in incredible detail swag under the eaves -- again, so far from the street level and they cannot be appreciated. But the architect and Gilsey knew these details were there. The Gilsey House was an instant success. The bar, made of silver dollars, became a world-wide destination. Contemporary celebrities like Samuel Clemens, Diamond Jim Brady and Oscar Wilde passed through those halls. Troubles for the Gilsey House began in 1904 when legal battles between the Gilsey family and the hotel's operator boiled over. On December 12 of that year the operator ordered all guests out of the hotel with essentially no notice. Although things returned to normal soon, the hotel's problems continued and it finally closed in 1911. Shortly thereafter the wonderful cast iron columns that projected over the property line were removed and the building, once host to the wealthiest guests in the world, became a seedy loft building. By the 1970's the future of the Gilsey House was doubtful at best. Water leaked into the building, rust attacked the structure and floors sagged. Amazingly, in 1980 Richard Berry and F. Anthony Zunino purchased the Gilsey and converted it to residential co-ops. Cosmetic restoration using fiberglass reproductions of the columns and other architectural details were installed and, for the time being, brought the Gilsey back to life. Astonishingly, the ground floor details -- normally the first thing to be lost under pseudo-modern facades -- remain. In 1991 the co-op backed an actual restoration and today the Gilsey House is proud and stately again. Unfortunately, picture windows replace arched 19th Century designs and the important projecting columns will, no doubt, never be replaced. But the Gilsey House survives and wows me everytime I pass by. This is yet another building I've never noticed before. Your blog is providing me with a notebook jammed with places I need to see the next time I'm back int he city. I also never noticed this building before. The funny thing is that I know that I've passed it dozens of times.